Holy moly, it’s the Umphrey’s McGee product you never knew you wanted. 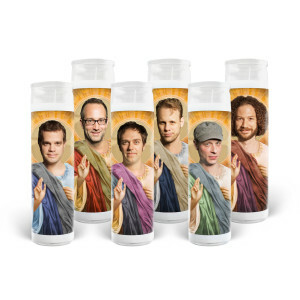 We’ve teamed up with Austin-based Iluminidol to bring you Saint Umphrey’s Candles. Available individually or as a discounted bundle of 6, Saint Umphrey’s Candles can light up your home (and your heart) this holiday season. Reminiscent of traditional 8" glass prayer candles, each is a high-resolution designed image with gloss finish produced using clean burning paraffin wax. Whether you’re a spiritual person or simply devoted to face-melting rock, we hope you get a kick out of this fun holiday gift. Made in the USA. I absolutely love these! Kudos to team UM merch for making this happen! Having these on my shelf in the dining room has been a great conversation starter. These are the best candles money can buy. I've cleansed my house and now we rage.